This is an online review of the DVD Tony Bennett: The Music Never Ends. With movie synopsis, cast, pictures, wallpapers, quotes, where to buy it and more. Clint Eastwood presents a documentary on the extraordinary career of one of music's greats: Tony Bennett. Bennett is considered to be one of the greatest living singers in American popular music, and this film reflects all that he has accomplished while living against the background of a changing America. The 90-minute film weaves archival footage with contemporary clips of Bennett performing live throughout his career including him singing his famous hits "I Left My Heart in San Francisco" and "For Once in My Life". Peppered throughout the film are interviews with celebrities reminiscing about their favorite moments with the legendary singer. It is a story of integrity winning over adversity...and of art triumphing over all. Woven together masterfully by directory Bruce Ricker, the film brings Tony Bennett's warmth, heart and soul to the screen just as he brings it to each of his songs. Bonus material in this two-disc special edition brings together rarely seen archival clips, exclusive new performance footage of Tony's Monterey Jazz Festival premiere and revealing conversations with interviewer Clint Eastwood. The two legendary entertainers share an easy on-screen rappor as they reflect on the singer's life and career. 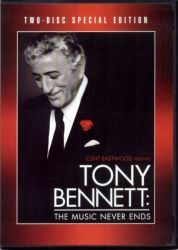 - Tony Bennett fans, jazz fans and music lovers in general will be delighted with these release. A.D.
Official Website and Links: Tony Bennett: The Music Never Ends at Warner Bros.